Oh, how I wish I could entertain you with some charmingly romantic story about my first encounter with tiella. I’d love to say I was hiking between hillside villages in the Italian countryside and I stumbled upon the most wonderful, humble, little osteria. A wrinkled old woman, cheeks dusted with flour, wearing a checkered kerchief, beckoned me in to try a piece of her legendary tiella. Nope. My first encounter was less exotic, far less romantic. It was less fairytale and way more suburban mall food court. It occurred to me as I was slicing into my homemade, wilted greens and garlic-filled tiella that it looked an awful lot like the spinach-stuffed pizza from sbarro that I’d splurge on with my hard-earned baby-sitting cash during my teeny-bopper mall-cruising days. My more “authentic” experiences with tiella are hardly more exotic or romantic. In fact, the last time I had it in Italy, it was from a gas station, eaten from my lap, as we frantically drove to our next destination, while I complained bitterly about Matt’s driving style and my extreme nausea. That’s okay, though. I don’t think tiella is supposed to be put on a pedestal. All it is, really, is a double crusted pizza pie, filled with whatever tasty ingredients you fancy. And while my old lady-osteria fantasy might exist somewhere, even in Italy you are way more likely to find yourself a piece of tiella at a convenience store or bar or take-away joint. Alright, let’s get going. We’ll whip up the dough first, then put the filling together. 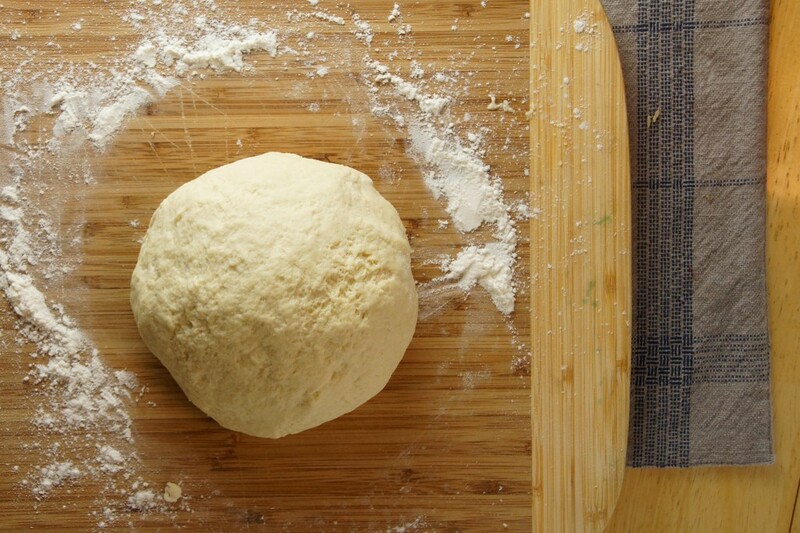 This dough yields a crust that is halfway between pizza and foccacia. Mmm…what more could you ask for? Equal parts all-purpose and semolina flours, water, yeast, sugar, salt, water, and a decent dose of olive oil. 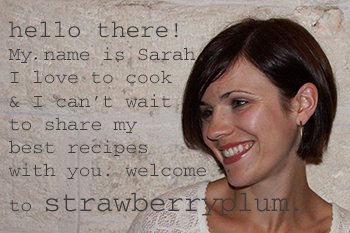 Process until a rough ball forms, then plop it out, and knead until it is soft and smooth. 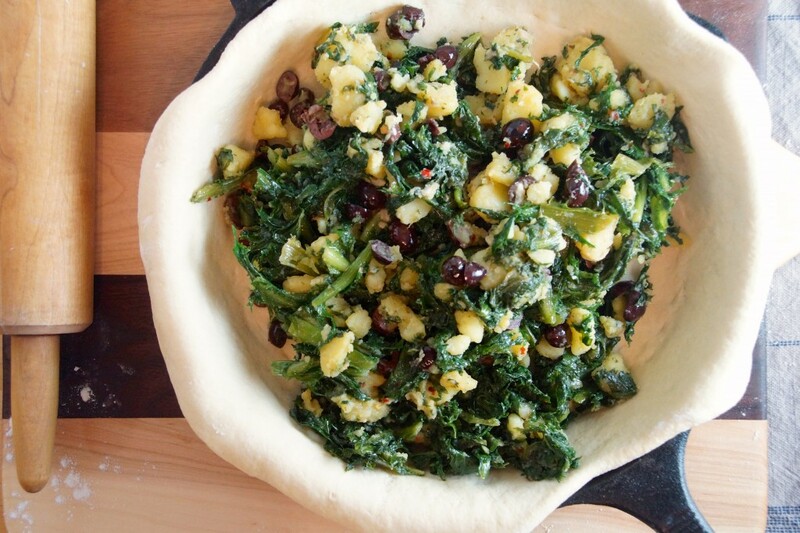 Let the dough rest and rise while you make your tiella filling. You could put nearly anything between layers of homemade pizza dough and it would taste good. I’m filling mine with curly endive that has been wilted down with garlic, red pepper flakes, anchovy paste, olives, and potatoes. You could add some ricotta or mozzarella, if you like. You could leave out the anchovy (but I wouldn’t!). You could sneak in a bit of Italian sausage, salami, or capicola if you want to bulk it up. You could use escarole, radicchio, or broccoli rabe instead of the endive. Skip the greens all together and do something with eggplant and tomatoes. Get the picture? It’s versatile. Sauté garlic with red pepper flakes in plenty of olive oil until golden and fragrant. Add a squirt of anchovy paste, give it a stir. This is not first date food, people. Toss the greens in, let them wilt down and absorb all of the garlic-y goodness. Boil the potatoes. Peel and fork-smash them into bite-sized chunks. Combine them with the wilted greens and chopped olives. Stir, taste, season, cool. Divide the dough: 2/3, 1/3. 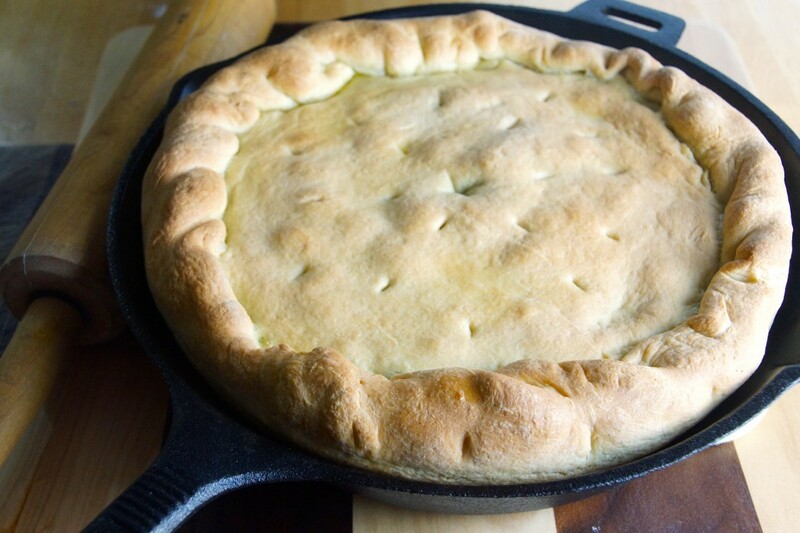 Roll the big piece out to make the bottom crust and press it into a skillet. Forget the food court, the Italian gas station, the imagined village osteria; the best tiella is made at home. The filling for tiella can be customized to your liking. 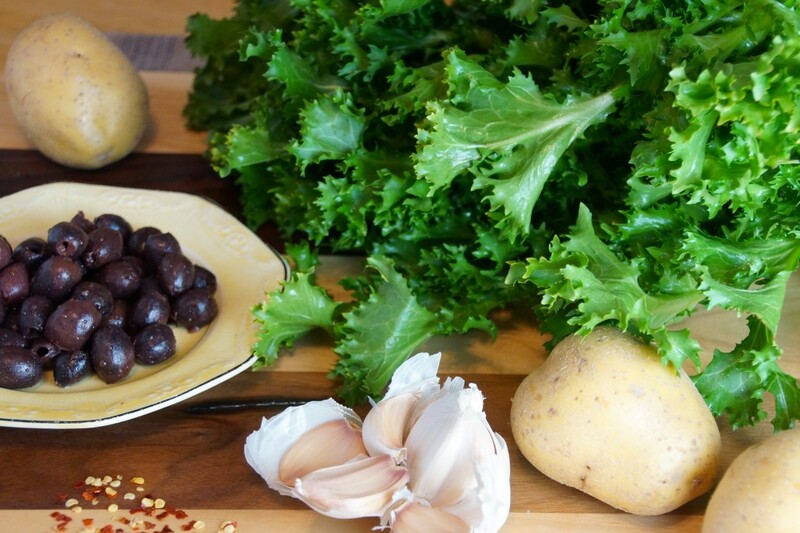 I enjoyed the combination of wilted greens, olives, and garlic with potatoes for added substance. 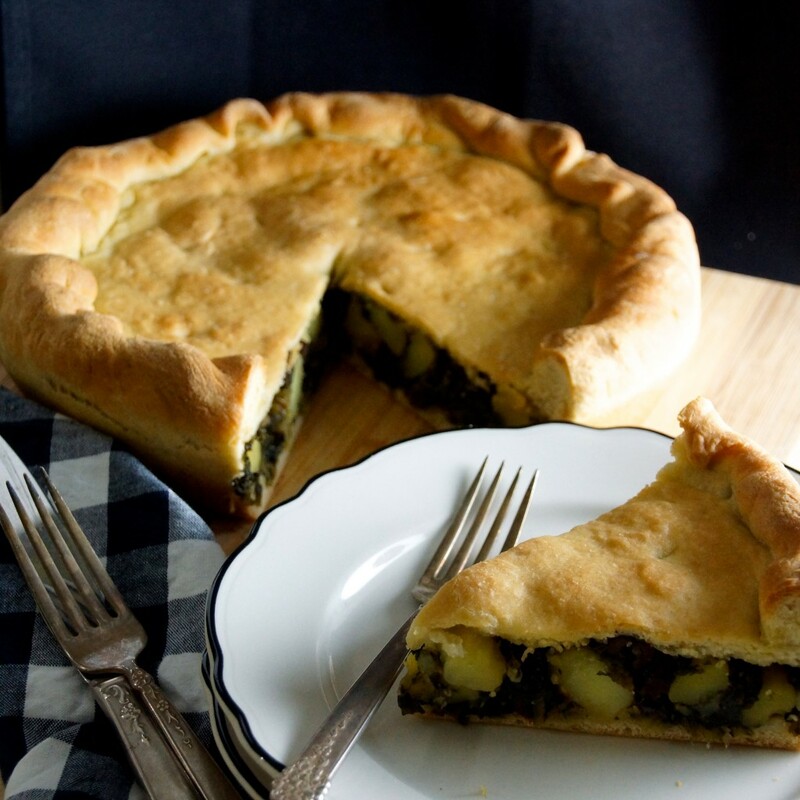 I bake tiella in an iron skillet but you could use any oven-proof skillet or a deep pie pan. Dissolve the yeast in the warm water and let it sit for a few minutes until it starts to get bubbly. 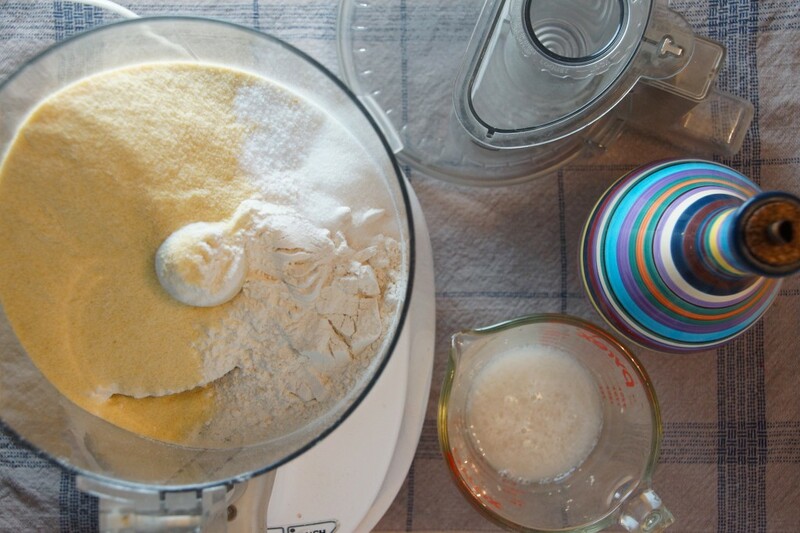 Combine both flours, sugar, and salt in the bowl of a food processor. Pulse several times until well-combined. Add ¾ c. cool water and 3 Tbsp. olive oil to the active yeast and stir. With the food processor running, slowly add the yeast mixture through the tube until a soft, somewhat wet ball of dough forms, about 30 seconds. 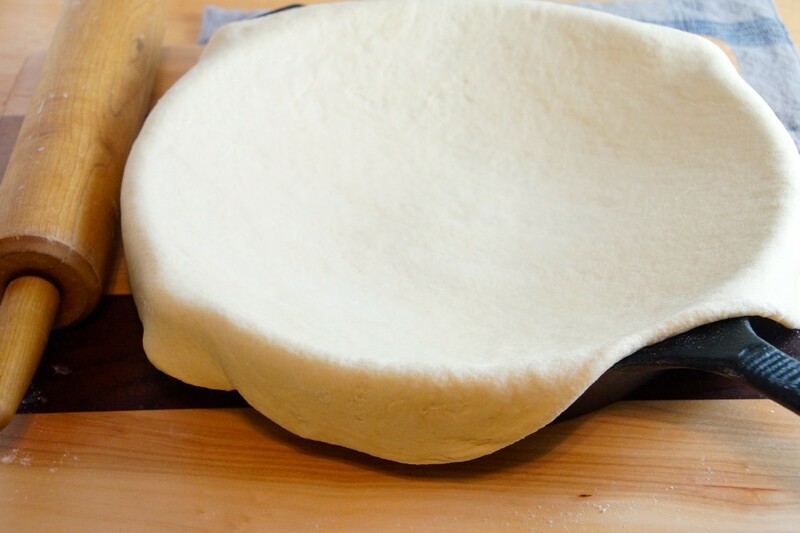 If the dough is too wet and does not clear the sides of the bowl, add a little more flour. If the dough seems to dry and stiff, add a Tbsp. or 2 of water. Turn the dough out onto a floured surface and knead briefly until soft, smooth, and elastic. Place in an oiled bowl, cover, and allow to rise until doubled in size, 1-1½ hours. Meanwhile, prepare the tiella filling. Boil the potatoes until tender, about 25 minutes. Drain, peel, reserve. While the potatoes are boiling, sauté garlic in olive oil until golden, about 1 minute, in a large pot over medium heat. Add red pepper flakes and anchovy paste, briefly sauté. Add the chopped endive, partially cover the pot, and allow the greens to wilt, about 20 minutes. 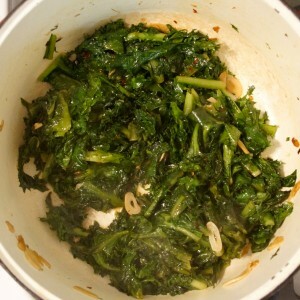 If there is a lot of moisture in the pan, drain in greens in a colander before proceeding. 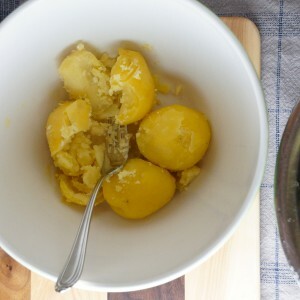 Place the potatoes in a large bowl and lightly smash with the back of a fork, breaking them up into bite-sized pieces. 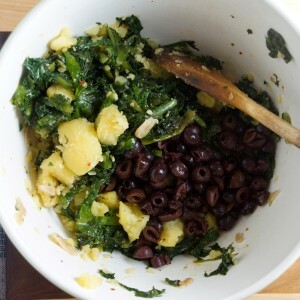 Add the wilted greens and olives, stir to combine. Taste. Season as needed with salt (you shouldn't need much- the olives and anchovies both contributed plenty), black pepper, olive oil, and vinegar. Preheat oven to 375°. Lightly oil a 12 inch skillet or pie pan. Divide the dough, ⅔ for the bottom crust, ⅓ for the top. 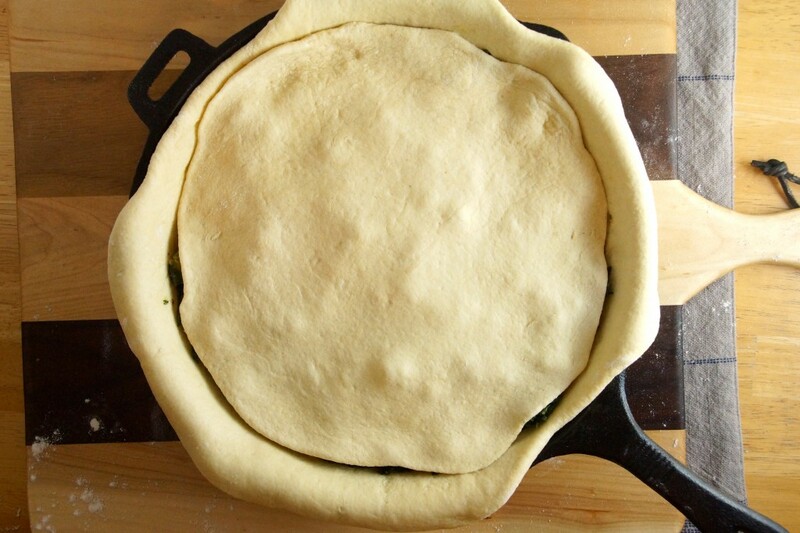 Roll the large piece of dough into a circle large enough to fit the skillet and hang over the edge about an inch. 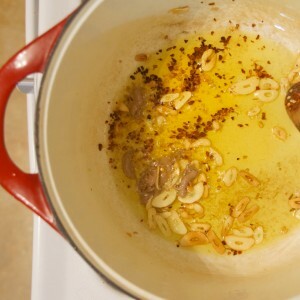 Press into the pan and add the tiella filling. Spread the filling around evenly and compress slightly. Roll the remaining dough into a circle large enough to cover the filling. 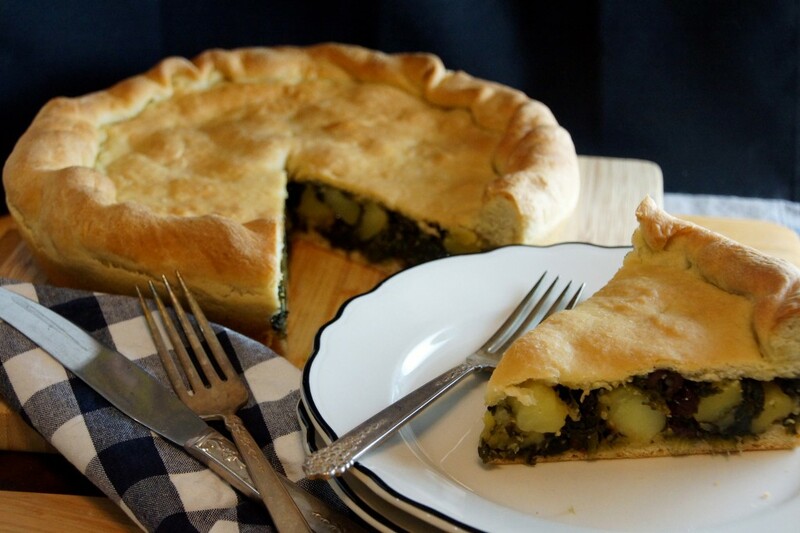 Lay the top crust on the filling, roll the overhanging edges of the bottom crust, and pinch together as if you are making a double-crusted pie. Make a couple of small slashes in the top crust to allow the steam to escape while baking. Brush the top with a little olive oil and bake until golden, about 45 minutes. Let the baked tiella rest for at least 45 minutes before slicing (I know, I know, but it won't hold together as well if you cut it as soon as you pull it out of the oven). Tiella can be served warm or at room temperature and keeps well for several days.